Never to be finished, poor pacing, battle roayle vibe. Animation is..odd. Story is too fast in regards to development, ep. 12 is far from a season finale, let alone series, poorly explained and convoluted plot. The list goes on and on. It also get much worse as the story goes on. Even if you recently acquired immortality, I would not recommend wasting any time on this. It's not as frustratingly bad as say Breaking Bad, but it is a waste. can you give it zero stars? I had high hopes for this. The concept seemed interesting. After the first episode I started to become skeptical, but decided to keep watching anyway. Biggest regret of my life. I managed to hold on untill episode 9 (9!) before I had to give up due to the stupid. The plot felt very disarranged, plotlines appeared only to disappear and the motivation of the characters felt really shallow or downright stupid. Don't watch this and save yourself some valuable time. Go watch Mob Psycho 100 or One Punch Man instead. 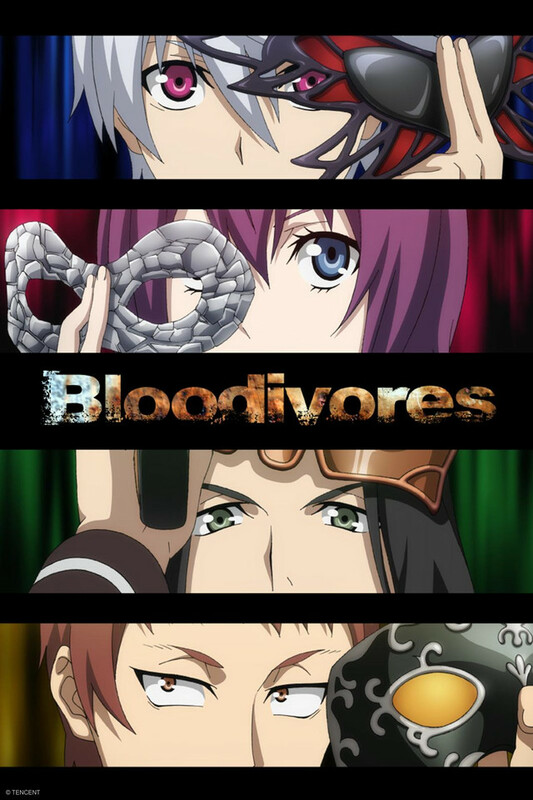 When I started watching Bloodivores, I had no opinion on its origin. I was even more perplexed as the opening was in Chinese but then again the overall feeling didn't "shout" Chinese. I delved into that and learned the series comic originated from China. Kudos to the creators. It was a great example of a marriage between Chinese and Japanese creators. I hope we see more works like this. Out with introductions and into the series. After watching the first couple of episodes and hearing the word "Hemomancer" I had an awful deja vu to Deadman Wonderland (Powers Wise) and had started lowering my expectations. Needless to say, I was very wrong and very happy about it. The artwork was nothing out the ordinary, the music was enjoyable but some BGM was a bit annoying. The series was unique enough and a very interesting story was lying behind. The characters were admittedly not very interesting due to them not being explored too much. Little knowledge was given about their lives and even less about their goals and powers. Now for the ending. Is it a cliffhanger? I really can't say. Typically an ending has answers and progressively lays the foundation for the next instalment. This time around no answers were given and even more questions arose. I really hope they can continue their work so we can get more answers. To give a final verdict, let's say it was not too shabby. Now that all cards are on the table, I believe, it's worth a watch. Definitely, not a polished series but has great ideas for a second better season. Only time will tell if their choice about the final episode was right. I'm not sure what the others hate so much about it. This looks like a story that was built to last a long time. However, the anime just gives you a taste. This isn't out of the ordinary for animes, though. I've seen tons of shows where I needed to finish the cliffhangers by reading the manga. It piqued my interest and I'm excited to read the rest (Space-Time Prisoner). Well, I never thought I would write a title like that as a defence of sorts... The fact is, Bloodivores have the fame of being one of the worst anime in history, at least if you believe its atrocious MAL rating and even most of the reviews here on CR. And too be honest, that's a bit of an exaggeration. While this series is shallow, poorly produced and ends at possibly the most insulting cliffhanger in history of media, for the most part it's just super average and generic. I was actually irritated many more times by Deadmen Wonderland than by this. Also, the weird mistakes by animators, like pump action shotguns firing like machineguns in 4-5 different scenes are quite humorous. With the rest of it... It's just there, it's pretty hard to say anything specific about either it's flaws or merits, because it simply doesn't do anything remarkable most of the time. So, is it forgettable and not really worth your time? Definitely. Is it the worst anime ever? Definitely not. I have watched the entire show. I thought the start was fairly interesting because I wanted a nice Saturday morning anime to watch. Turns out that I had no idea what I was thinking because I have no idea what happened throughout the entire show. The power system makes no sense along with the characters for the most part being forgettable. Not an amazing show still watched it twice. I really enjoyed watching this, and I would love to have more. You get small backstories for our main four and mysteries throughout. True, the animation is wonky at times, but the story is worth it. These are not your traditional vampires, and you will be pleased watching them learn to survive. I understand why some people don't like it; there are so many parts of the plot left unanswered. Unfortunately, this anime was supposed to get a second season where they answer all those questions but because so many people seem to not like it theres no more second season But honestly this anime is a hidden gem-- it was amazing. It's so exciting and it makes you really think along with the characters. I just think if it had more seasons it would give the audience time to really understand what's going on. Such a grand storyline can't have only 12 episodes and expect anything to make sense. For example imagine if Hunter x Hunter or Fairy Tail only had 12 episodes. I love that there are no filler episodes-- everything moves fast and it's onto the next thing. It's truly a shame this anime is not being done anymore but if you can you should FOR SURE check it out and watch some of the episodes! You're better off watching other titles. I couldn't bear watching through it as it is so sub-par. I don't think this is really made in Japan. Quality and story are poor.Characters are bland. Crunchyroll also seems to be making it hard to write negative reviews...c'mon enough with the "write a longer review".